AP CETs Dates 2019: APSCHE Entrance Tests Dates 2019, AP Entrance Exams Dates 2019, Online AP CETs Dates 2019, PSCHE CETs Dates 2019, AP Common Entrance Exams Schedule: AP state government had announced the dates of different have "CETs". But we have provided here Online AP CETs Schedule for information to the students and which was already announced by AP State Council of Higher Education, Hyderabad . These Online CETs to be conducted by the APSCHE. Where these "Online CETs" change the life of a student. It is the turning point of a student. A student prepares for Online EAMCET, Online LAWCET, Online ECET, Online ICET, Online EDCET etc exams not only at the time of exam. They plans before couple of years and do hard work according to his knowledge, will power etc. A good rank decides the seat in good college, pursuing degree in the best college the student develops different skills which gives him bright future. A good rank is based on the presentation of exam at that particular period. So, the date of exam is very important. Preparing for exam keeping in view the date of exam is very crucial. 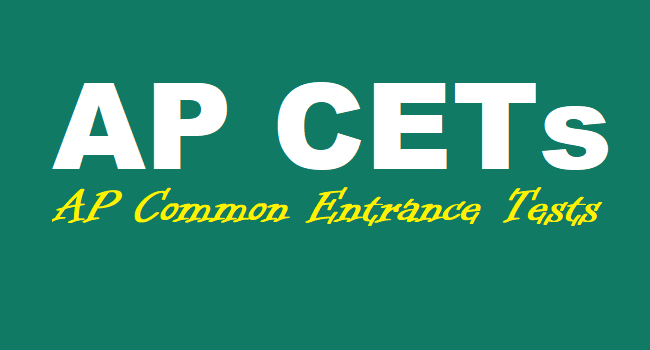 AP CETs 2019 Dates: Check schedule for APEAMCET, APICET, APPGECET and other exams. Andhra Pradesh State Council of Higher Education (APSCHE) has released the exam dates for various Andhra Pradesh Common Entrance Tests (AP CET). The candidates who wish to apply for the these State Common Entrance Tests are advised to check the exam schedules given below for their reference. As per the exam schedule released by the Andhra Pradesh State Council of Higher Education, the AP ECET 2019 exam will be conducted on April 19, 2019, by JNTU, Ananthapuram. the AP EAMCET will be conducted on April 20, 22 for Engineering and for Agriculture stream, and the exams for Agriculture will be conducted on April 24, 2019. The AP EAMCET 2019 will be conducted by JNTU Kakinada. Similar, the APICET 2019 exam will be held on April 26, 2019. This exam will also be conducted by SVU Tirupathi. The APPGECET 2019 will be conducted from May 1 to 4, 2019, by the Andhra University Visakhapatanam. For more details, visit the official website of the Andhra Pradesh State Council of Higher Education. Keeping in view the date of exams, prepare well and do your best. There is no shortcut for success. Hard work it self is the success mantra So, do hard work and reach your success. The Andhra Pradesh State Higher Education Council (APSCHE) has announced the schedule of the Common Entrance Tests to be held by the council for the academic year 2019-20. The much awaited date for the AP Engineering, Agriculture and Medical Common Entrance Test is announced to be held from April 20 to 24. All the CETs will be held in online mode. The APSCHE has also made a mobile application, APCETS Nestham, for the benefit of the candidates. “Complete information on the CETS from schedule to counselling has been put up in the App. It is especially useful for the candidates to locate their examination center and is designed in a student-centric model. Two exams APEDCET and AP LAWCET are scheduled to be held on the same day of May 6. While EdCET will be held in the morning session between 10 am to 1 pm, the LAWCET will be held in the afternoon session between 2.30 pm to 4.30 pm. The officials said that the candidates applying for both the tests will have enough time to attempt them both. The examination dates and timings of the seven common entrance tests have been released and no changes have been made in the universities that conduct the exams, from last year. The CETs begin with AP Engineering Common Entrance Test (for B Tech Lateral Entry) to be held on April 19 and will end with AP Physical Education Common Entrance Test to be held from May 8 to 15. Hall tickets/Admit Cards download from..